These Car Speaker Brands Are On Display At Great Prices! The best way to buy your new speakers is to listen to them first. 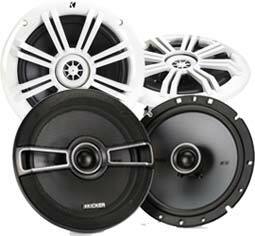 NATIONAL AUTO SOUND & SECURITY carries a wide selection of car speakers of every description. We carry top of the line speakers from Pioneer including their top of the line Pioneer Z Series & D Series. In addition we carry the best that Kenwood offers, their Kenwood eXcelon series. Also we have Polk Audio including their top Polk MM series. Even more we carry Kicker speakers including their marine speaker line. As you can see we are serious about good sound. We provide a great selection of brands so you can feel confident about making your choice. And we provide an unparalleled speaker warranty. Click below to find out more. From as low as $29.99 a pair on up, we have what you need with car speakers to fit any car. Bring your own music with you. Listen and see how speakers compare and which ones you like the best. No appointment needed, just come in. Professional speaker installation is available daily. With your purchase get the local support you deserve. Speakers purchased online have no local replacement warranty. Since we are authorized dealers for the car audio speakers we sell, we give a local Speaker Replacement Warranty and local product support. See our local support benefits when you buy from us, especially if we install your purchase.